When Madam Karina discovers Domino in an alleyway, she offers her a position inside her home for entertainers in secluded West Texas. Left with few alternatives and an agenda of her own, Domino accepts. It isn't long before she is fighting her way up the ranks to gain the madam's approval. But after suffering weeks of bullying and unearthing the madam's secrets, Domino decides to leave. It'll be harder than she thinks, though, because the madam doesn't like to lose inventory. But then, Madam Karina doesn't know about the person living inside Domino's mind. 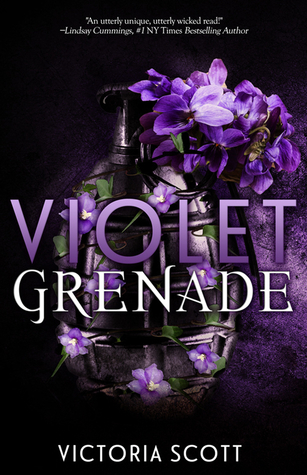 I absolutely loved Violet Grenade. It is such a wild ride of a story that you can not put it down. As I was reading I decided that there are three things that make it so you can’t put the book down. One you really want to know about Domino and Wilson’s past and what happened to make her the way she is. Two, what in the name of all things purple is up with that house! Three, Cain and his backstory which bleeds into other backstories. I really loved this plot and I think Victoria is great at writing these dark riveting stories (as you know if you read Four Houses). I couldn’t stop reading. I had to know, I just had to know! It’s also very fast paced, there is no lull where you are waiting for the next thing to happen. Something is always happening! I loved Domino. I have a fondness for dark characters as an MC because it’s not as common. Even though Domino has this dark part of her, she also has kindness. She wants to be cared about and care about people but has gotten herself hurt. She has this protective mode that is not only about Wilson and in a way it keeps her sane. I realize yes there is Wilson. I really really liked her character and the way she finds that she really does have her own power to take care of herself. I also liked Wilson too. At first I was a little weary like, oh this is strange, but I think you start to understand them both better as you read. Cain, Poppet and Angie are all great characters. I loved the friendship that develops between Domino and Poppet. They become great support for each other. I also really like the relationship that develops between Domino and Cain. I liked it because the story doesn’t need it. If nothing ever developed it would be fine because everything else about this plot is so absorbing. I always enjoy reading a romance that enhances a story but isn’t the story. Madam Karina and her minions of nut cases. Wow..wow. I mean you are kind of leary of her from the beginning because I feel like anyone that runs a home for girls with “talents” is suspicious. The more you dive in though the more and more interesting it becomes. That’s all I have to say about it. I liked so many things about this story and so many plot things that I really don’t want to reveal. I liked discovering them myself so I hope everyone gets that opportunity. Anything can happen that’s all I’m going to say.